Pros: Customers respond consistently We get many good leads.. Surprising how many leads we get through this tool. Pros: Information is constant and leads are many. trade-in information has to be current. Pros: Works well unless information isn't transmitted correctly. Cons: Inaccurate information is a huge black hole. Pros: Clear expectations for the customer, has all info for being transparent and easy to make choices with all the information. Pros: We really like this product, as it helps us get deals done. Pros: Great lead volume and they close at 18%. Easy, simple process for consumer that engages them with your dealership. Make deals you may ordinarily miss because of the buy bid feature. Pros: I let the app report to the customer and then I'm the good guy. Many sales from this tool. Much action with this option. Pros: Our Rep is the best and this tool sells cars. Easy tool for customers to find pricing. Pros: Easy for salespeople too. Never a problem. 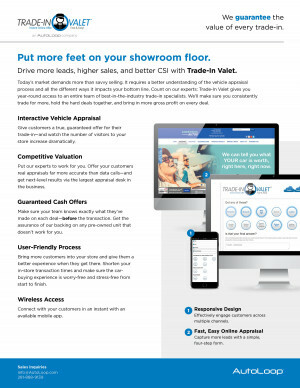 Best CRM an this tool makes trade-ins easy. Pros: No problems and the leads keep happening.